(Pictured are Club Members Carmine Cimilio and Samanatha Gray with the new statue). The undisputed 'King of Rock and Roll", Elvis Presley has made his debut at Madame Tussauds Sydney. Taking pride of place in a special Las Vegas style chapel, Elvis was welcomed with open arms by a line of adoring brides and grooms. The couples were all dressed for the occasion in white gowns and smart suits to be serenaded by 'The King' himself. Not to be outdone, Elvis was styled to perfection in his signature rhinestone encrusted jumpsuit, positioned down on one knee at the altar. "We are very excited to have The King of Rock and Roll finally grace our shores. Elvis Presley's spirit is still very much alive in Australia. As one of the greatest musicians of all time with a very loyal fan base, we hope visitors will be thrilled to have the opportunity to get up close to the of 'The King'," commented Quinn Clarke, General Manager, Madame Tussauds Sydney. Elvis Presley is a cultural icon of the 20th century, renowned for pioneering a new style of music, dance and of course, the Elvis quiff. It took Madame Tussauds artists over 140 hours to recreate the famous quiff using real human hair, which was individually inserted before being washed, cut and styled to perfection. 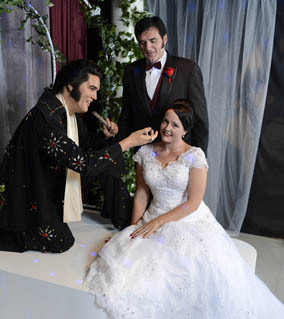 The legendary Elvis Presley will reside at Madame Tussauds Sydney for three months, where visitors can dress up, get down and have a toe tappin', hip swingin', knee shakin' lip quiverin' fun time in the Las Vegas Chapel of Love!